A world, in which countries and states are being occupied and bombed – against international law, where entire populations suffer colective punishments or are being imprisioned, where torture and killing are used to consolidate political or economical dictatorships, can no doubt be described as unjust. But one can say that an order is radically unjust, when protesting the injustice, and not the injustice itself, raises suspicion. When the indignation is forced to justify itself and the solidarity has to give explantions. Why experience the pain of others as if it were our own? Why react in the face of injustice? Why show solidarity with its victims? Why demand that international laws be respected? Why Palestine? Why Gaza? Why – in fact – insist on the value of a human life? Of ethics? Of civilized normality? Why is snow white? There is something vicious and destructive in changing the questions around, in forcing with an acusating tone, a responce from those – all of us – who should demand an answer. Why not Palestine? Why does the siege on Gaza continue? Why is there no respect of international law and justice? Why does the snow turn black all of a sudden? It is natural for stones to fall and birds to fly; for the tides to go in and out; for the boats to try and get to Gaza in keeping with the laws guranteeing the freedom of movement and those of human solidarity. In the summer of 2010 Israel took over the mediterranean sea in order to assault the Mavi Marmara and kill some of its passengers. In the summer of 2011 Israel extended its blockade to the coasts of Europe in order to prevent the second Freedom Flotilla from setting sail. Now, since last July, a third Flotilla, is attempting again to re-establish the natural order of things; starting in Sweden it has sailed through the Baltic sea, is sailing in the Atlantic ocean and will sail the mediterranean asserting the right of the sun to rise in the east, that of the green to colour the leaves and of the children to kick a stone and play ball. A Flotilla? The beautiful sailing vessel Estelle make, as Thoureau would have said – confronted with slavery – “a majority of one”. A majority because, regardless of its numbers, it is the right thing to do. It form a majority also because on its side are the wind: the breath of thousands of people throughout the planet, who materially made this voyage possible and the millions who support it. One thing the gran majority of the global population knows is bad is ,no doubt, the occupation of Palestine; If there is an injustice that most people in the world know, the occidental governments would not amend, it is the occupation of Palestine. A handful of interests and a lot of money can produce a deadly missle; a great bunch of will powers and an anormous colective effort can give birth to a sailing ship. The Estelle is the Mother-Humanity parting the waters, it is the Child-Solidarity surfing the waves. Why do we insist? The most obvious answer is the fact that Israel insists on maintaining the blockade. Six years have passed by, the slow deterioration of the situation is closing in on the Gaza Strip, the most densely populated territory on the planet, a “humanitarian catastrophe” of which the children (44% of Gaza’s residents are under 14) are the principal victims. The unemployment, the poverty, the lack of fuel and the growing deficiency of electric supply, are bringing Gaza – according to Oxfam’s February report – “towards a total collapse of the essential sevices”. Save the Children reports that 58% of school age children suffer from anemia, and worns of a growing number of cases of typhoid fever and diarrhea, without hesitating at the time of naming the responsibles nor at the point of proposing solutions: “as a question of urgent priority for the health and welbeing of the children of Gaza, Israel has to lift the blockade completely and allow freedom of movement of people and goods into Gaza and out of the Strip, including from and towards the West Bank and East Jerusalem.” Amnesty International, has no doubt either: “the fundamental cause of this humanitarian crisis is Israel’s blockade, which constitues a colective punishment (a violation of international law) and particularly affects children and sick people.” Recent attacks by Israel and the U.S.A on UNRWA, the UN agency responsible for the supply of food and the administration of education, threatens with worsening the endemic problems of malnutrition in the short term and leaving thousands of children without access to schools and study centres. The blockade is a silent bomb which blows up everyday, causing deadly wounds to 1,700,000 people. But, why insist? Clearly, the Estelle, if it reaches its destination, won’t solve the problems of Gaza’s population, with the cement sacks and footballs it carries as its cargo. This isn’t its purpose. 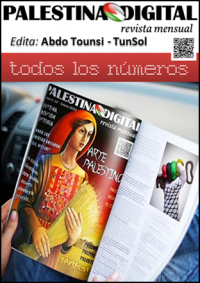 The initiative’s potential, coordinated in Spain by Rumbo a Gaza, is better measured by its symbolic and political results and can be summarised, in my opinion, in these three insights. The first being at the same time symbolic and practical. The idea of starting off in Sweden and stopping at different ports in three seas, means in practice a sort of subrogated territorial libertation. 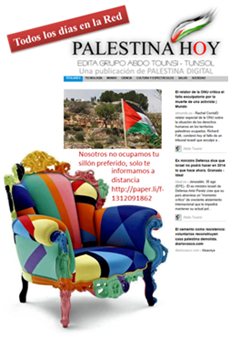 Last year – we mentioned it above – Israel “blockaded” the coasts of Europe. Gaza is in every port where the Estelle docks, every harbor is Gaza. Therefore, even before it arrives at its destination in Palestine, the sailing ship, born by Humanity would have lifted the blockade many times over, restoring the sovereignity, which the European governments hadn’t defended last year in Greece, to the European nations. The Estelle, in a sense, is re-establishing the legality of the European Union and liberating our coasts of the illegal Israeli occupation. The second insight has something to do with its evident character of a claim. The U.S.A and European powers, who used to yield to the now overthrown dictatorships, have been forced by the Arab revolutions to intervene in the name of democracy and human rights. However, this false speech only underlines the exeptional situation of Palestine, or shall we say, the exeptional case of the Israeli dictatorship, against which no western government is willing to intervene, if only in the form of condemnation or sanctions. Estelle‘s passage through Europe is a call against the criminal complicity of this Europe, which makes use of human rights speech – and even humanitarian bombs – to better defend its interests and those of Israel, in the region. To insist on Gaza, while the Arab world is still unstable with the aftershock of the popular movements and the imperialistic counter-revolution, is precisely the help needed in order to distinguish between the various battling forces and guarantee the anti-colonial horizon of the transformations in the area. Palestine, with Gaza as live embers in its midst – radiates light in all directions. Remembering Gaza is remembering that the people’s struggle necessarily begins and ends in Palestine. The third insight, linked to the previous one, has to do with the naked affirmation of the universal character of human rights. The fact that the western powers manipulate and misuse international laws and institutions, putting them at the service of deceitful interests, should not cause us to question their origins. Outside the realm of the laws, besides the issue of rights, they have the power; and if we don’t possess the strength to impose the rule of law, the laws and what is right can remind people on who’s side justice stands and make sure they don’t forget the legitimacy of resistance and the struggle for freedom. They have the power, but ours is the right. In medieval times, culture found refuge in the monasteries; today there are seed banks, where specimens are conserved of all plants to safeguard them in case of a catastrophe. In our case, the Estelle, an offshoot of Mother-humanity, is the vault where the fundation letter of the UN, the Geneva conventions and the international treaties are kept; it is in this sole vessel, and not in the NATO war planes or the G-20 meetings, where humanity protects the Declaration of Human Rights and the international laws, whose conquest cost so many sacrifices and deaths. Why insist on Gaza? There is a fourth reason, elemental like the right of the sun to rise at the east, the right of green to colour the grass and the right of children to kick a stone and jump over a wall. The Estelle simply declares our genetic right to feel the pain of another, to protest against the injustice and to hug, as one people, above and beyond the national interests, all those we love wherever they may be on the face of the earth. We insist, and will go on insisting. The Estelle is now one; we are all the wind blowing its sails. Esta entrada se publicó el 22/08/2012, 14:50 y se archivó como Human rights, Palestine. Puedes seguir cualquier respuesta a esta entrada a través de RSS 2.0. Puedes dejar una respuesta, o trackback desde tu propio sitio.